If you haven’t already shifted to a data-based recruiting approach, December is an ideal time to see the benefits resulting from using data to take what I call “right-time” recruiting actions. Most executives and recruiting leaders are shocked when they learn that nearly 50 percent of all employee turnover in the sales group occurs during a narrow time period around the end of the year. 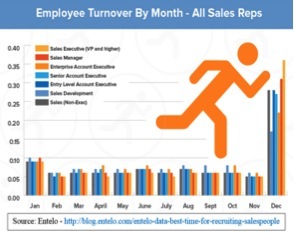 In fact, data from the smart people at Entelo covering over 1 million resumes reveals that December has such a large spike in sales and sales executive turnover that it simply can’t be ignored by recruiters (see the chart). December is what I call a “right month,” meaning that it is the right time to target sales professionals because that is the time that they are most likely to be extremely open to new job opportunities. What Is “Right Time” Recruiting? If you’re not familiar with the concept, right-time recruiting is any day or time period where a normally reluctant top-performing recruiting target would be significantly more likely to say yes to an offer to consider a new job. In this case for salespeople, December is a right month to recruit. Other categories of “right times” include when a target firm is going through a layoff or some significant business, ethical, or legal problems (i.e. VW and Yahoo). Another version of “right day” recruiting is when your recruiting target is facing a major career decision, like when a close colleague or their manager quits, a major project of theirs comes to an end, or when they are facing a work anniversary date. There are even “right times during the day” (i.e. 10 a.m.), when employed recruiting targets are more likely to accept a recruiter’s call. You don’t have to be a rocket scientist to realize that employees in the corporate sales group are among the most critical employees in your organization because they directly generate most of your corporate revenue. But they also add tremendous value because they are often the face of the company to your large customers, and once that relationship is lost, it is expensive and difficult to rebuild. Because of the significant value that they add, sales staff are often rated as a No. 1 priority by both the recruiting and retention function. Rather Than Taking the Month Off, Recruiters Must Be Proactive! Between Thanksgiving and the rest of the year in the Silicon Valley and in many other geographic areas around the U.S., it is mostly a dead period for recruiting. It’s a dead recruiting period because most hiring managers are frequently out of the office and most potential recruiting targets are simply focused on the holidays, rather than looking for a new job. But be careful about generalizing, because during December, a majority of the sales professionals are likely to be mentally deciding whether to stay with their current company or to seek a new job. 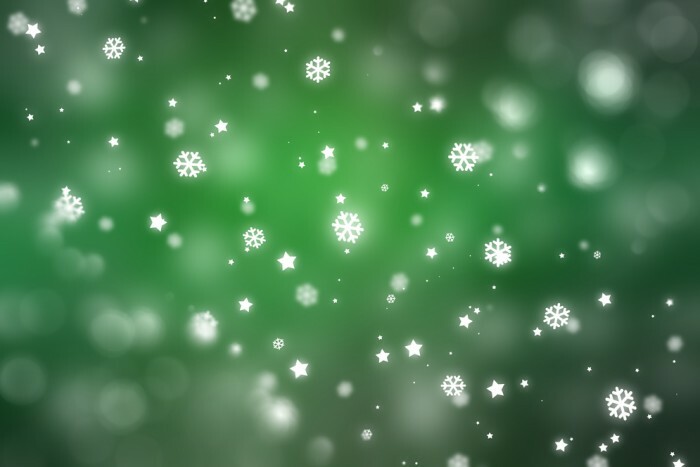 Obviously a major cause of this December reflection is because year-end sales bonuses are paid then and new commission formulas are about to be implemented. But also because sales is so stressful, sales employees are pondering whether they want to “do it again for another year” at the same company. It’s also a great time to recruit them because 90 percent of recruiting functions are not data-driven. And as a result, the recruiting competition for salespeople will be lower because most corporate recruiting leaders will mistakenly wait until January to begin their recruiting pitches, when it will be too late to land the best. Incidentally because December is a dead period for recruiters covering all jobs, the lack of recruiting competition makes it a great time to recruit for firms that don’t have a great employer brand. Recruiting is just like fishing — you catch the biggest and best fish when they are biting. So if you want to take advantage of the sales staff job search spike, here are some action steps to consider. Examine your own sales turnover — take a close look at your own firm’s sales staff turnover data to see if it spikes in December. Also see if your best performers leave during that time period. Examine your quality of hire — also examine your data on quality of hire (on the job performance) in order to verify that your best-performing new hire salespeople have been recruited around the end of the year. Reserve your sales position openings — if your new corporate budget starts in January, January will be too late to capture the very best salespeople. So unless your CFO will give you some leeway, purposely “hold” some vacant sales staff positions for use in early and late December. In a few cases, it may also make sense to hold off from filling vacant sales positions in November, in order to wait for this upcoming surge in talent availability. Put together a retention plan for your own sales staff — because of this turnover spike, your own HR and management staff should develop a process to pre-identify your high-quality sales staff who may be “at risk” of leaving. Beginning as early as the summer put together a personalized retention plan to re-recruit each of your “regrettable” employee retention targets. You should also know that similar research by Entelo demonstrated that the most likely time that all employees quit is around the anniversary date of their hiring. The time for recruiting functions to shift to a data-driven approach has long passed. The best recruiting functions are already moving further ahead towards predictive metrics. Predictive metrics allow you to proactively educate your recruiters and hiring managers in advance about the right time for recruiting in each key job family. With this predictive data, the recruiting function can then alert hiring managers about upcoming recruiting/retention problems and opportunities. The time is come to stop relying on intuition and instead to shift to a forward-looking data-driven “right time” approach in all areas of recruiting.